A new vision for the collection, storage, and publication of reference data. 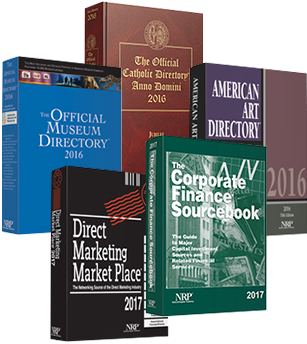 Formally known as National Register Publishing, NRP Direct is dedicated to providing our customers with valuable business reference information. Whether you are seeking to penetrate new markets, analyze the competition, or simply find a qualified vendor or partner, the NRP Direct family of professional reference products offers the most accurate, comprehensive and up-to-date information available. To satisfy the changing needs of our customers, all of the NRP Direct reference books will soon be made available online and we are currently working to bring other changes to the market as quickly as possible. To find out more about NRP Direct and its products, please read on or select a specific product from the menu at the top of the page. Published since 1817 by P.J. Kenedy & Sons, it's the only authorized directory listing the personnel, institutions, and organizations related to the Catholic Church. The official guide to over 15,000 museums, historic sites, planetariums, technology centers — everything from aquariums to zoos. Data on industry services and suppliers is included. "The Networking Source of the Direct Marketing Industry!" Used by both direct marketers and service firms/suppliers to make key contacts and prospect for new business. Tap into the global economy with the financial industry's number one money-finder. Find complete details on the top investment sources and the foremost service firms. The visual arts resource with vital data on thousands of art institutions in the U.S. and Canada. Also included is information on art schools and fellowships, state arts councils, and more. Please enter your questions, comments, and suggestions here.